93% of customers are using iOS 6. So Apple’s published this chart recently that I’m sure most of you have seen. 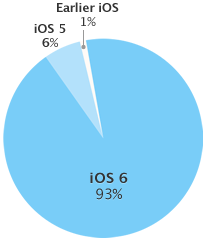 It claims that 93% of customers are running iOS 6 and 99% are running iOS 5 or later. If accurate it’s pretty amazing. And why wouldn’t it be accurate? Well it’s possible that this only includes those devices that are capable of running iOS 6. That’s a lot of phones. But notice that of the 350 million or so iPhones sold, at the very least, 26 million (8%) are incapable of running anything later than iOS 4.2.1. And that doesn’t include those iPhone 3Gs (not 3GSs… I don’t know how to make that plural). sold between Q4-2009 and Q3-2010. A fairly conservative guess puts that number closer to 40 million or 11%. That doesn’t really line up with Apple’s chart. Of course a lot of these phones are probably no longer functional or in service but 90% of them? Another possibility is that the people using these phones just don’t visit the App Store that often. So, for various reasons, we’re not seeing many original iPhone and iPhone 3G users represented in Apple’s chart, but will we see the same adoption rate with iOS 7? I personally see a lot of iPhone 3GS users still out there. It’s not even been a year since it was discontinued after all. It difficult to know exactly how many iPhone 3GSs were sold, but I think a reasonable estimate is around 73 million, or 21% of the total iPhones. If you add in the old crusty iPhone and iPhone 3G models it’s almost one third of all of the iPhones ever sold. And even if, let’s say, only half of all of these phones are still in use, that would work out to about 11% of active iPhone users that won’t be able to make the jump to iOS 7 even if they wanted to. Now add to that the people that won’t update because… who knows (these are the 7% in the current chart) and those that refuse to update because they don’t like the new version (yay polarization!) and it could be a while before iOS 7’s adoption rate gets anywhere near where iOS 6 is today.